The Festive Season is upon us and I wanted a quick fix make: a dressy dress that would also be comfortable to wear. You know how it goes: christmas day is spent eating and lounging around on the floor, playing games, opening presents etc. And before christmas day are the inevitable meals out/ drinks etc. Velvet is very on trend at the moment and as I had some stretch velvet in my stash I just need the inspiration. This is my version – and I am going to say it right upfront. I DISLIKE IT. So much so that I am only going to post one picture of it. (Forgive the opaque tights: these pictures were taken one very cold afternoon before rushing off to the school nativity play). I don’t think it is the patterns fault as such. I have seen a couple of decent versions of this pattern sewn up. I think my issue is the proportions of the collar on my significant bust! It just doesn’t look right. I would have probably preferred for the neck to be a bit deeper too. Furthermore, I took the decision to self line the collar because I didn’t want to have to deal with a potentially messy hem with the velvet, and I don’t think the self lining was such a great idea. The collar just won’t sit quite right. Anyway, this dress is sadly a wadder for me. I did actually end up wearing it out to the nativity with a cardigan over the top, and then we went out for dinner afterwards. But nope, it will probably be donated. Apart from a little bit of time I haven’t lost much. Review below. But then! 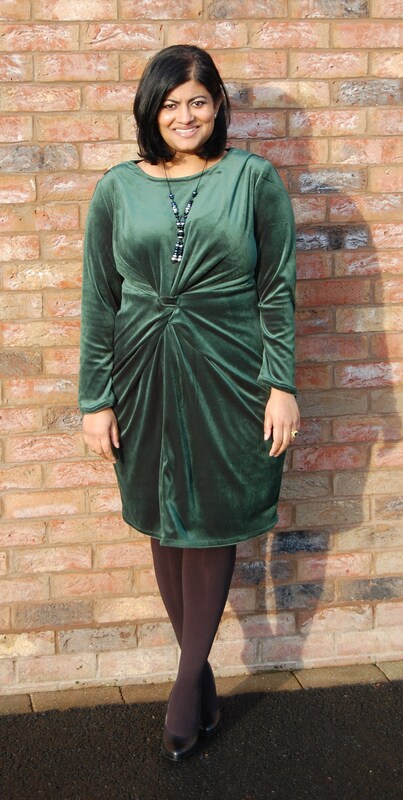 I decided I HAD to have a velvet dress so I purchased 2 metres of another stretch velvet in a deep bottle green (much nicer colour wise IRL than in these photos). This second velvet was heavier than the black. hmmmm…. I used Vogue 1359 (now OOP) which I have made previously with great success (see here for details). I assumed there would be no fit issues and ploughed on, eager to get finished. The only changes made were that this velvet version is unlined (the neckline is finished with a facing) and the hem was eventually finished with a bias facing because it ended up being too short….see below. So, the issue with this green dress is that the waistline is far to high: about 1 – 2 inches too high. I am guessing (?) it is to do with the bulkiness of the front knot causing the waistline to ride up? I ended up having to stitch the knot into place because the opening was pulling open. Ergh! I am NOT happy with the fit even though it doesn’t look that bad in the photographs, I am disappointed. 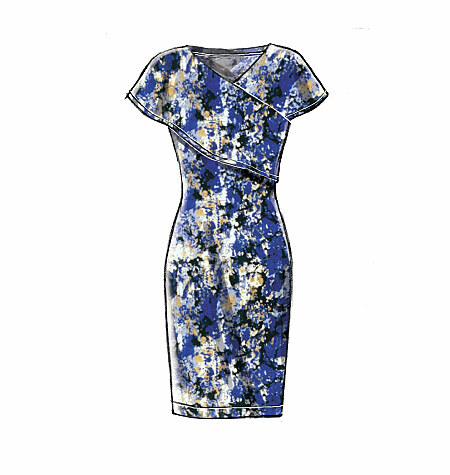 Close-fitting, pullover top and dresses have collar, and stitched hems. Narrow hem finish on collar, and armholes A.
I sized down on the bust and graded out over the waist/ hips. For the most part yes. The way the collar is finished is something like a flat fell finish? Little tricky but doable. I do not like this dress on me at all. It’s not the fault of the pattern: I have seen decent versions on other sewists. I think my major issue is the proportion of the collar on my significant bust! It just doesn’t look right. I would have probably preferred for the neck to be a bit deeper too. Furthermore, I took the decision to self line the collar because I didn’t want to have to deal with a potentially messy hem with the velvet, and I don’t think the self lining was such a great idea. The collar just won’t sit quite right. I did cut the outer curve of the collar at the largest size because I did have a feeling the collar would be proportionally small, but to no avail. I did a 1″ sway back adjustment. I added 3 inches to the length (yep, this dress is short. I am 5’3″ FYI). I decided to self line the collar to avoid hemming the velvet….mistake. I think the velvet against velvet is part of the problem of the collar not sitting right. I used a walking foot to sew. I stabilised the shoulders with clear elastic. I staystitched the neckline (not mentioned in instructions). Nope. Yep I would recommend if you like the look (i.e. are smaller in the bust). You win some, you lose some. Sadly this dress is not for me and will probably be donated. In conclusion, I daresay the green dress will be worn over christmas (maybe…maybe not). I still wanted to share these dresses with you because, hey life throws us a few wadders sometimes…until soon. The knot on the green velvet dress, and waistline, look proprtionate in the pictures. I agree that the McCalls isn’t working out – hack off the bodice, sew an elastic waistband and have a useful skirt? That green is such a great colour on you, but man, velvet is not a quick or easy sew ;-). I was hoping for that too, but then found it was so shifty and that handstitching was the only way that I liked the look of anything. I think the waistline on the green looks good from the pictures. It is highish but if it is too high, it doesn’t draw attention to being any higher than your natural waist – it just suggest your legs are longer. I wonder if the fit has changed because of the degree of stretch in the velvet. I know that threw me. I used a stretch velvet but it only stretched one way and not as much as I expected so I had to make several modifications to the knit pattern I was initially working on. Actually, the more I look at the green dress, the more I like it. Jay makes a good suggestion with the brown version too. It would make a lovely skirt if you chopped it up. Thanks Debbie. I do like the idea of having a velvet dress. But, for me, its a little like the elusive perfect LBD…yet to be conquered! Maybe next year I will try a silk velvet and be a bit more patient! I know how it is when something just doesn’t *feel* right on, even when it looks good. Meh. It DOES look good and man that color is gorgeous! Thanks Aminat! Wadders are part of sewing. Just accept and move on I say! I quite love the green dress, the color is gorgeous! I agree that the first dress isn’t the most flattering thing you’ve made, but I actually quite like the green one. The color is fantastic on you, and the issue that you’ve mentioned don’t show in the photographs. Maybe take a breather from that one in the “magic closet”? Thanks Michelle. Yeah I think step away from it for a while. Might feel different about it in a few days. Its funny we all sew and make some wonderful things but in exactly the same way the Christmas party season gets us, we all want that dress that looks great but is comfy and effortless. I think sometimes we forget the tantrums in dressing rooms the day before the ‘do’ that ready to wear brings. The greet velvet is a yummy colour. I am so happy you posted about these dresses – that you weren’t happy with them. It’s always helpful to read reviews that aren’t all ‘everything is perfectly perfect’ because real life isn’t always pretty & perfect like a pretty & perfect blog post! I agree that velvet is never an easy sew, but the green is so gorgeous, perhaps you could salvage a top from it? Thanks again for posting. Real life is way more inspiring that perfection all the time. Thanks Tia Dia and yep, I agree, sometimes it’s nice to see when things don’t work out because sometimes we learn from others mistakes too. I understand about the black one – but the green one looks great. I don’t see any fit problems, and the color and fabric look great on you , plus perfect for the holidays. Thanks Beth. The green doesn’t look that bad in the pics but I know I will be tugging at it all night. Argh! Posting these is very helpful – I was eyeing M7243 as well, and I think you are right about it not being suitable for larger busts. Too bad! I do actually like the green one on you, the colour is so pretty. Oh well on to the next, right? So many patterns so little time….. Thanks Kat. I kind of hope someone with a bigger bust makes it and makes it work! Lol. But, nope, I think modifying it will be quite complex. Yes, I am already thinking of what to sew next…. You are so beautiful and I almost always love your makes. You are right about these two dresses, however. Not good on you. I think we are shaped similarly and I think you should think about a shoulder adjustment for these patterns. Our shoulders are just not that big and we need more definition. I always look best with a small shoulder pad. I think that some attention to my shoulders make my bust look smaller. Thanks sissy. I did actually consider adding a shoulder pad to the green dress. Maybe something I will try out on my next make: I agree sometimes they can help balance out a larger bust. Sometimes we love a pattern, and have an illusion that it will turn into a dream dress, but in reality, it doesn`t live up to our expectations. I know that feeling.One has to feel good in what we wear, The green fabric suits you and hubby likes the dress. You`ve made very beautiful outfits in the past. I`m inspired by your honesty and openess, just let go and start again. Actually I agree with a few before: the green looks great – perhaps not what you imagined. I like my dress waistlines to sit a bit high like this, is more flattering as my tummy isn’t flat. When you say tugging is that because it will move up? Maybe some grosgrain ribbon around internal waist would help? Happy Christmas partying! Thanks tessellator. Yes tugging to keep the waistline down. PS. I wonder what the crisscross dress would look like without the star trekky cap sleeves? Perhaps make the dress sleeveless, or rework them as set in sleeves? Or would that spoil the lines? I love that you put these questions out there! You cannot remove the sleeves: they are not actually sleeves but part of the collar. Oh I am sorry you are not happy with your dresses but I must say that green color looks fantastic on you! Thanks tomasa. Happy Christmas to you! That green one suits you. Maybe a smooth slip would help with comfort? The brown could be taken apart and used for your child. Or maybe a renfrew, or a turtleneck? In the first dress- could you gather the cross piece so it’s more drapey? I love these fabrics- you can’t leave them!! Not sure about gathering it Anne but just keeping hold of both dresses for now. Sorry to comment so long after you posted this. I’ve only recently discovered your blog and just wanted to say how refreshing I find it! Can’t tell you how reassuring it is to know that even someone as experienced as you can have disappointing makes, just like the rest of us!! I think the most important thing is to learn from it, then you won’t regard it as a waste of your time and money. Have a great Christmas and keep sewing, I’m looking forward to seeing what you make in the New Year. Thanks so much Kathryn I have already moved on from these dresses: you have to learn from your mistakes. Happy Christmas. What a shame. I notice that the Zara dress has folds on the cross pieces, maybe that’s the difference? But I agree with the others that a skirt maybe your best save option with that one. The green one is a great from fit the back, but I think the velvet is maybe too thick for the twist effect? Hope your next project(s) come out more how you envisaged them.